Online ordering menu for Cordello's Pizza & Wings. 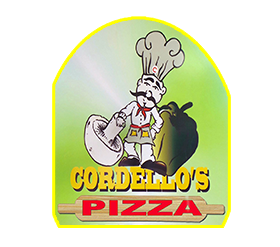 Try one of our tasty pizzas here at Cordello's Pizza & Wings such as the Meat Lovers, Alfredo Chicken & Broccoli, or the Greek. We also serve calzones, pasta, salads, and sandwiches! Come find us north of Pierpont Bay at the corner of Thompson Blvd and Hurst Avenue. We're near Ocean Avenue Park and Community Memorial Hospital. Order online for carryout or delivery!